(i) Qigong raises our vitality, strengthens our nervous systems and allows free flow of energy through our meridians. A soft flowing combination of Qigong, Tai Chi & Meditation in harmony with the Seasons. 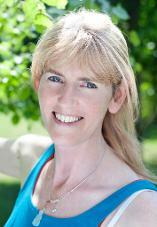 Pam's sessions comprise of Qigong flows, adapted to stimulate acupressure points as well as the energy channels, or meridians. 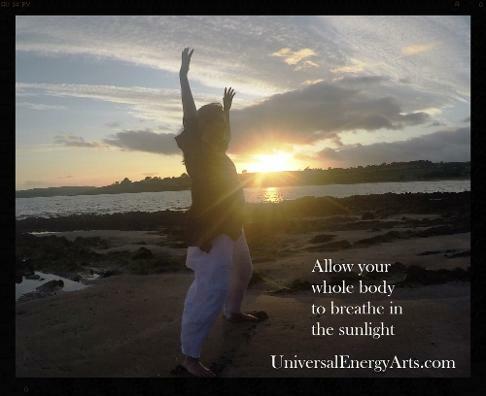 This skillful practice activates the body’s natural ability to heal itself: releasing blocked energy, cleansing the body of toxins and strengthening the practitioner’s physical and energetic systems. The benefits of tuning into and flowing with the season while practicing Yoga can greatly enhance and balance your health and well-being on many levels. (iii) Mindfulness with Breathing brings us into the present moment and develops alert and sensitive awareness. (iv) Healing Sounds and Mantra chanting practices empower us, heals and harmonises our internal organs and energy centres. (v) Tai Chi brings perfect harmony with Nature, the Elements, raises our Consciousness and connects us to Divine Love. It is the art of the harmony of yin and yang in tangible form. It is a graceful, gentle form of physical exercise and meditative movements that reduce stress, increase strength, well-being, flexibility and natural balance. (vi) Guided Relaxation/Yoga Nidra where the physical body can relax and become still, to absorb the virtue and merit of the energy cultivated, yet the mind remains present and alert, encouraging deep healing to occur naturally. 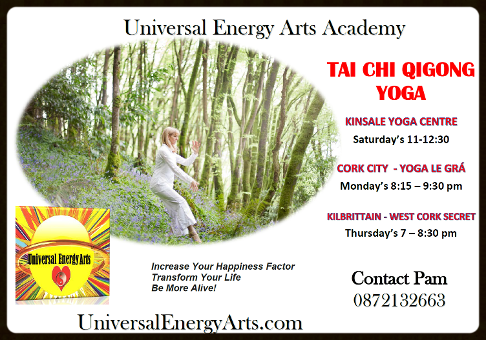 Tai Chi, Qigong, Yoga, Healing Sounds and Meditation activate the body’s natural ability to heal itself, releasing blocked energy, cleansing the body of toxins and strengthening the practitioner’s physical, emotional, mental and energetic systems. By trying out different kinds of guided chi kung/Tai Chi mindful meditative movements, mantra/sound healing meditations and meditation chants is a great way find which skillful technique works best for you and when to use it. One meditation chant may affect you differently from another, just as one guided meditation will work for you in a way another does not. The only way to know is to experiment. In mantra meditation, the healing sounds resonate at certain frequencies that are the frequencies of creation. "Om/Aum" is the most often used mantra because it is the sound of creation. The classes will combine the ancient Arts of Tai Chi, Qigong, Yoga & Meditation - Energy-raising sequences tuning into Nature's Elements of each Season. Through mindful practice, each movement encourages our energy centres (chakras) and channels (meridians) to open resulting in a free flow of energy throughout our bodies. The freedom this facilitates overflows into our every day bringing us more readily into ease, alignment, strength, balance, harmony and peace of mind. Sequences and practices can all be adapted to suit everyone. Each class is taught intuitively to suit the needs of those present. One to One and Group sessions of Tai Chi, Chi Kung/Qigong, Yoga, Meditation, Healing Sounds, Stress Management, Relaxation, Yoga Nidra and Ling Chi Healing Art with Pamela or Yogi Cho can be arranged by appointment.